The railroad sector is front and center of the debate on the industrial economy in 2019. 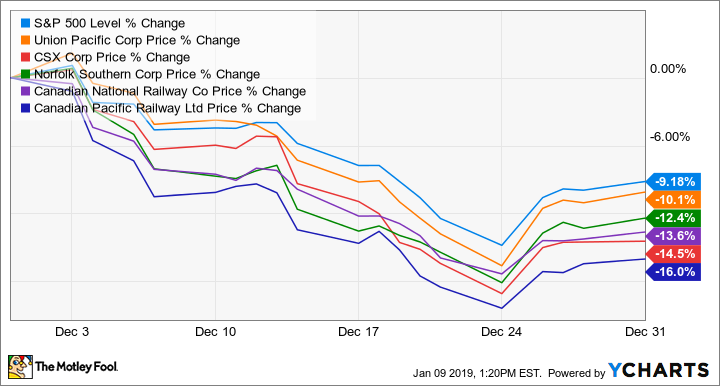 December wasn't a great month for the stock market, and it definitely wasn't a good one for the railroad sector. According to data provided by S&P Global Market Intelligence, shares in Union Pacific (NYSE:UNP), CSX Corporation (NASDAQ:CSX), Norfolk Southern Corporation (NYSE:NSC), and others slumped more than 10% in the month and even managed to underperform the dismal decline in the S&P 500 index. What happened, and should investors be concerned? As the economy goes, so does the transportation sector, so the decline in stock prices is most likely a consequence of negative sentiment on the economy rather than a collection of specific issues. It's no coincidence that the whole sector was marked down in December. What's more surprising is that the decline wasn't accompanied by any deterioration in reported numbers from the industry. While you might expect company quarterly reports to lag end-market conditions -- they are reports on the previous quarter's performance and are given a few weeks after the quarter finishes -- investors can access weekly traffic reports from the Association of American Railroads (AAR). The good news is if we delve into recent data, it's clear that rail traffic has held up well so far. According to the AAR, U.S. railroad carloads were up 2.9% year over year in December, with combined carload and intermodal originations up 4%. In addition, 2019 has started brightly with total U.S. weekly carloads and intermodal units up 4.8% to Jan. 5 compared to the same week last year. The bad news is that anecdotal evidence and other leading indicators of the economy are suggesting slowing growth, and there's no shortage of uncertainty regarding the U.S./China trade dispute. 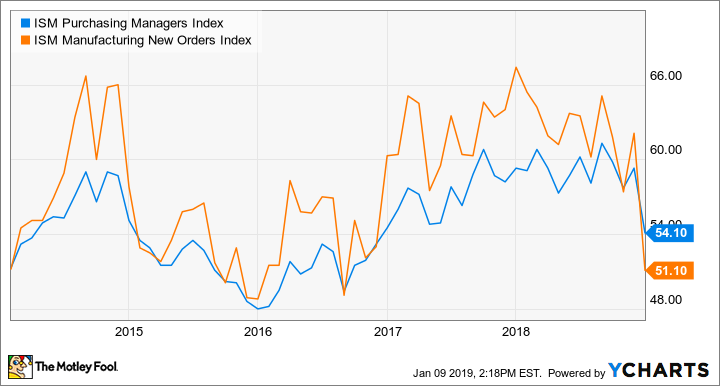 For example, as you can see in the chart below, the Institute for Supply Management (ISM) Purchasing Managers Index (PMI) and its new-orders component declined notably in December. While a reading above 50 still indicates growth, the drop in the PMI could presage the kind of slowdown in U.S. industrial production that occurred in 2015 to mid-2017. As you can see in the chart below, CSX, Union Pacific, and Norfolk Southern tend to track conditions in U.S. industrial production, and they suffered in the last industrial production slowdown. Moreover, the railroads have significant exposure to any escalation in trade conflict with China. For example, around 21% of Union Pacific's freight revenue comes from the agriculture sector, and any hit to export markets from tariffs by China (the country is usually the largest purchaser of U.S. soybean exports) will hit the railroads hard. Similarly, the slowdown in China appears to be negatively impacting energy and mining commodity prices, and if they stay low for a protracted period, it's likely that capital spending in the sector will be restrained -- not good news for railroads that are major transporters of bulky equipment and commodities. 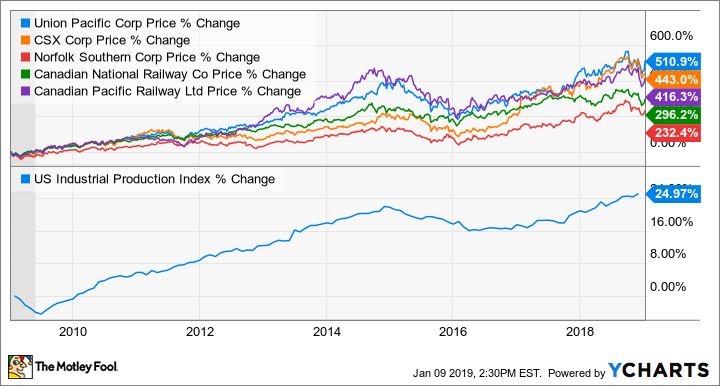 As you can see below, Norfolk Southern, CSX, and Union Pacific all suffered earnings declines in the last period of industrial weakness, which was accompanied/caused by falling commodity prices. This is hardly surprising, as chemicals and metals and equipment are key industry verticals for railroads. UNP EBIT (TTM) data by YCharts. In addition, if there's an industrial slowdown this time around, it's unlikely to be accompanied by a period of strong automotive sales -- as it was in 2015-2017. Rather ironically, transporting automobiles is a significant activity for railroads -- the automotive sector provided more than 10% of CSX's revenue in the first nine months of 2018. It's important to note that the stock price falls in December were caused by fears over and projections of a slowdown rather than by hard evidence of the reality. Nevertheless, leading indicators (PMI, oil prices, car sales, etc.) are suggesting a moderating growth environment. On the other hand, a resolution to the trade conflict, a pickup in growth in China, and a recovery in commodity prices would likely see a positive shift in sentiment. 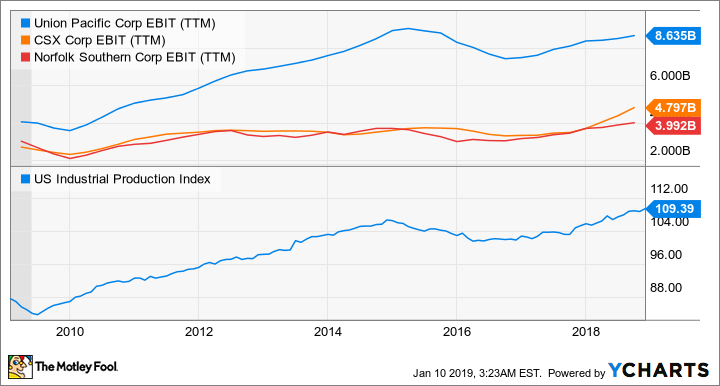 While it's difficult to have a strong opinion on these issues, what's certain is that the railroad and transportation sector is likely to be a key battleground between bears and bulls and will probably set the tone for the overall market in 2019. This is a space to be watched closely. Check out the latest Union Pacific, CSX Corporation, and Norfolk Southern Corporation earnings call transcripts.